"You have been unsubscribed from the Areivim mailing list. Before leaving, you may want to consider retaining only your Avodah subscription." To which I responded: why was I unsubscribed?! ask the list management at avodah-owner@aishdas.org or in addition to the author. Violating this rule could result in immediate dismissal ch"v.
reason that we would have denied it -- this wasn't dirty laundry or anything someone would be embarrassed to see discussed beyond the community. However, you didn't. We can't have members who defy the chevrah's trust in the list's privacy. Your Avodah subscription remains. My response: All I can say is I thought better of you people. I obviously didn't intentionally ignore the rules, yet you couldn't wait to send me flying. Not nice. Areivim exists as distinct from the public Avodah. If I didn't firmly enforce the rule, I would have no recourse against someone who mines Areivim for things to post in some anti-Orthodox forum. Tzig asks: How would someone know whether or not I got permission? The anti-Orthodox excuse makes no sense. To which Micha responded: You didn't ask any of the moderators... so that part of the process wasn't followed. I'm not arguing this. You were warned that such citation could lead to being summarily dismissed. You were therefore summarily dismissed. The active term is "summarily". I asked: I was asking about your reasoning. You said that if you didn't enforce it the anti-Orthodox would comment-mine and use it it to their benefit. Yet all you ask is that I ask for permission. To which I say, how would they know whether or not I got permission? so why use that as a reason to dismiss me? The Bergermeister curtly responded: Look: You accepted a rule. The consequences of the rule are spelledout. You violated the rule. You are paying the price spelled out. This isn't rocket science. The rule is important because if people find Areivim posts all over the web they are less likely to be as forthright in posting to the list. Discussions that have in the past led to changes by the Agudah, the OU, and in the prosecution of the Lanner case (admitted small changes) would stop if people felt they may be risking their children's shidduchim (or whatnot). I therefore promise a measure of privacy, which means I must enforce the privacy when it is violated. Correct me if I'm wrong, people, but the whole lot of them seem pretty haugty and stuck-up to me. I may have told Abish Brodt to "get off his high horse," but these guys ride giraffes, not horses, horses aren't high enough for them. They must look at that mirror and tell it how lucky it is to have that beautiful, Torah'dike, yet MO light face to host. I mean, after all, having Toby Katz AND Harry Maryles as regular contributors must make that list pretty darn proud, no? Today is election day in Beitar, - they're voting for Mayor - and never has there been more excitement and anxiety in the little town over the Green Line. The current Mayor, Mr. Pindros, is (IIRC) an alumnus of Ponovizher Yeshivah, but a seemingly nice guy. There's a sizeable Chabad presence in Beitar, as well as many other Chassidishe Kreizen, such as Boyan, Karlin, and Slonim. As Mayor one cannot bring his old biases with him, so obviously he needs to tolerate Chabad as well. Most Lubavitchers there say that he hasn't done anything to help their situation there, and that they have shuls and Yeshivos that still have no adequate living space after all these years of promises. I don't know much about the situation there, so I won't be the one to decide. 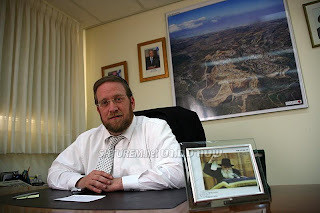 The other candidate is one Meir Rubinstein, a Breslover Chossid who's running on the Chassidic/Sefardic line. He has the support of such Kehillos as Breslov, part of Chabad, Karlin, and the Sefardic vote, while Pindros had the Agudah/Degel vote, which gives him the Gerrer and Misnagdic/B'nei Teyreh vote. I have little interest in the vote outcome, I have bigger concerns, like Abish Brodt and RMBW. But what gets me is how politicians will do anything for a few votes. If you're a former Yeshivah Bochur and a Talmid of Moron, and you think that all "Chabatzkers" are Apikorsim, and that they're the "closest religion to Judaism", and that they have a Moshiach Shekker, why then would you come and vie for their heretic votes?! It's not like he's a former frummie who went bad, he considers himself very much a Ben Teyreh, even today, so is he ignoring the words of his Rabbeyim?! Not only that but to get those pesky Lubabs to vote for him look what he does, he puts a picture of the Rebbe on his desk for all to see!!! What has this world come to, have people no shame at all?! We realize - Reb Abish - that you think you're the only Heimishe music out there today, and that you're the second coming of Ben-Zion Shenker. But what's with all the PR for your Son-In-Law's real estate company? Or was the Mishpachah cover a paid cover story? Shouldn't we be told that it is? Besides, that squeaky voice of yours gets to a guy after a while, and plenty of people sang Machnisei Rachamim before you recorded it. What makes you better than MBD or Fried, the fact that you're a sufferer of stage fright, and can't perform? We can't wait to hear at the convention Melava Malka, AGAIN!!!! I'm an avid reader. I read about all types of Jewish leaders, whether I agreed with all their policies or not. I feel a strong connection to Jewish History, and I like to be informed of what went on in the past. It gets a bit difficult when today's writers of biographies seem very intent on squeezing the protagonist into what they would want him to be, and turn him into a zealot/Takif/hateful person. It does a disservice to the Tzaddik/Rosh Yeshivah, and keeps people of a different mind from getting to know him and appreciating him. As you know I'm in the process of reading the biography of RMBW zt"l. My fears about his grandkids being Satmarer, (not that there's anything wrong with that) and the entire book being written from that slant were proven right, both from further reading and from what I heard from people that know the author and his family. Hence, much of his opinions are presented as very much in line with Satmar and the "extreme" elements of today, when in reality we know that he was a very educated man - not that he propogated TIDE - who abhorred ignorant people. There's a chapter that deals with his personality and Shittos, and how he was a very caring person who still managed to be tough when necessary. Actually they make him a tough person who remembered to be nice when necessary. Some of the stories are really inspiring and show us how today's leaders are so far and removed from the leaders of yesteryear. RMBW didn't care as much about HIS K'vod HaTeyreh as he did for the Kovod of the Torah itself. If it meant that his Kovod was to be compromised for the sake of building Torah then so be it. Actually it was never an issue that he had to "forego," he never cared about his Kovod at all. I may quote some examples later, but need to get to the point now. They speak of his opposition to what's known today as "Kiruv Rechokim," and how he was of the opinion that those who are Mekarev Rechokim are at the same time "Merachek Kerovim." They say that at the same time that they recount a slew of stories where he tried to bring Jews back to Yiddishkeit, both those that were frum before, and those that never were. He would speak to wayward Bochurim and try and convince them to remain frum. Yet, for some reason, in 1956-1957, when the "Tshuvah" movement was still in its infancy, he supposedly was all "against it!" The story goes as follows: There was a Yid in the Nitra Yeshivah named Reb Osher Schwebel z"l. The book doesn't say this, but I heard from former Talmidim that he was a Lubavitcher Chossid. I never saw his name mentioned in any Lubavitcher literataure, but then again maybe I just never realized it. 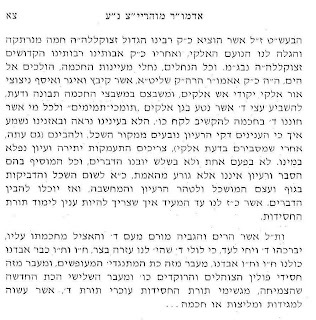 The book says the following: Reb Osher would travel to a certain Admo"r whose custom it was to be MeKarev ReChokim, and RMBW rebuked him for traveling to him, saying that "those that are MeKarev ReChokim tend to be MeRachek Kerovim. Das is Nichs unzer Derech!." Ad Kan Devorov HaK'Doshim. 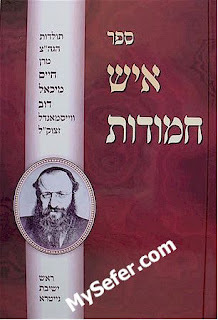 Even an Ungarisher Naar/Ferd like myself can add one plus one and see that the author is referring to the Rebbe. There's nothing simpler for a budding author or biographer today; if you want your book to succeed amongst the Heimishers attack the Rebbe, Tziyonim, or both. You're guaranteed the Williamsburg/BP crowd, and even those that are attacked will buy, I guess we all must all be a bunch of masochists. What's a guy like myself supposed to think about what I just read, and about what the protagonist's grandchild wants to make out of him? 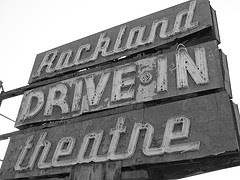 Another "proof" of his "stand" against Kiruv was the fact that he once took a drive to Valhalla, fifteen minutes away from Mt. Kisco, where the Yeshivah was and is located. He noted to the ones with him how many thousands of Jews there were living just in that short drive, and he wondered what he'd say to the B"D SHel Maaloh when they'll ask him after 120 years why he didn't try to bring them back to their roots. "I'll answer that I was working to rebuild the generation that was destroyed, and that I had a responsibility to the deceased parents of these Bochurim." Correct me if I'm wrong here, but does that sound like someone who thinks that bringing these Jews back to their roots is not on the agenda since it's not "Unzer Derech?!" Is it so important to reinvent a man who passed away fifty years ago, just so you Satmarer grandson of his will feel comfortable with every move your Zeide made?! That's why I named this thread the way I did; There's always some chapter in the book, especially when speaking about Litvishe or Hungarian Rabbonim, Roshei Yeshivah, and Rebbes, that'll make me squirm and wonder "why did I just spend 22.50 on this?" the Slonimer Rebbe, he decided to take his protégé to visit his Rebbe. 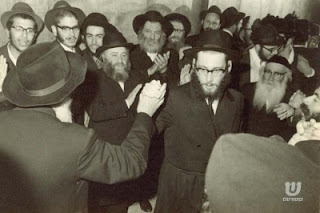 After they entered and were seated, the Slonimer Rebbe gave an apple to the young Chaim, who proceeded to take a voracious bite without first making a blessing. The Rebbe voiced his disapproval to his chossid, noting that if he were a better teacher, his student would understand the importance of reciting a blessing before eating. The young Chaim rejoined by passing the buck one step higher and impudently suggesting that if the Rebbe were on a higher level, his chassidim would be better teachers, who in turn would have better students!" If you're a Misnaged who things that all Chassidim and Rebbes were and are ignorant Kugel-Fressers then here's ample proof that even a young Reb Chaim could quickly outsmart even an old-time Rebbe. If you're a lover of all things Brisk you're sure to like the story simply because it shows Reb Chaim's Pikchus, even if it is at the expense of a great Tzaddik. If you're a Chossid you've got a dilemmma on your hands. You can't just put down Reb Chaim, even at that young age, after all he was Reb Chaim Brisker, so what do you do? I've yet to come up with an approach for you, but maybe the readers here can help. The commenters on Areivim, including one very irate lawyer, were quick to condemn the story as false. After all, it can't be that RCB would embarrass a Rebbe like that, even as a child. That's one approach, make the Tzaddik into what you'd like him to be. Another approach was "forget the story ever happened." We learn nothing from stories like that, the commenter says, so why repeat it? I'd like to hear what you people think. A letter from the Frierdiger Rebbe to a Mashpia in Toras Emes Yeshivah in Chevron. I realize the words here may seem harsh and even degrading, but I think if taken into perspective they can be seen in a positive light, even by those who may at first be offended. The letter was written about the Talmidim of the first Chassidic Yeshiva in the Holy Land, which was very much in the hands of the "Perushim" until then. The Rebbe felt that they're not carrying out the will of his holy father the Rashab, the founder of Tomchei Tmimim, who was still alive and well at the time. He felt that they somehow seemed to blend in "too well" with the rest of the Yeshivos, and that it wasn't "Nikker" on them that they were Chabad Chassidim and Bochurim. The fact that the Rebbe allowed for this letter to be printed in its entirety, when we know that other letters were omitted from the books of letters, tells us that this is important for us, the later generations, to know. It is VERY painful as it is a painful reminder of the extreme tzores of Klal Yisrael in this century. The tragedy that the Rabban Shel Kol Bnai Hagoleh had to remove his beard , flee Belz, his shul and hoif destroyed. He lost his complete family, lost 90% of his followers all besoch the immense tragedy of Klal Yisrael, it sure hurts me. OUCH, OUCH ! Here I had a golden opportunity to put my money where my mouth is, and I let it slip my fingers. I was at the Monsey Bus stop this Motzoei Shabbos waiting for my son and niece to arrive with the bus when I saw a strange sight. A middle-aged man wearing Yerushalmi garb steps out of a SUV and crosses the road to where the bus would stop. I thought I recognized him, but in the darkness it was tough to tell for sure. Later my worst fears were confirmed. KeYodua, almost all Yerushalmi Yidden who come to America, and there are many of them, remove their Yerushalmi Begodim while in Chutz Le'Aretz. There are a few exceptions, but they're mostly Rebbes like the Lelover U'CHedomeh. The fact that this man was wearing a "gold" striped Kaftan, but yet was on his own, waiting for someone else to arrive, narrowed down the choice to basically one man. This man could only be Moshe Ber Beck, king of the Galut Jews, who turns the other cheek and asks for more, and a man who never met a tyrant and Israel-hater he didn't love. When the bus arrived, who was to disembark but Yisroel Dovid Weiss, the snot-faced guy from Brooklyn who uses the word "Zuy-Enist" like it was a contagoius, deadly disease, and who gets his w-2 delivered directly from Hezbollah USA. For those of you who somehow don't know he's the one that speaks to the Press and explains the "Jewish View" to anybody who'll listen. Like so many others in the NK, Weiss grew up in a ModOrth home and later "found" the NK. Some of you may remember Chaim Tzvi, the Alte Bochur with a Yerushalmi hat and Reckel, and a white Yarmulka and black socks. He was waving the Palestinian flag 20 years ago, before most Palestinians knew what it looked like. He too is a convert to the NK, but he's been behind the scenes, I guess, or replaced by Weiss as the English-speaking press liaison. Weiss sees himself as one of the "only ones" who really understand how to save the Jewish People from both the Zionists and the Arab and Moslem dictators who wish to destroy the State of Israel. I guess when you grow up without Rabbinic guidance anything goes. So here I had my chance, I could make myself heard and finally do something for Am Yisroel. I could stand up to a group of two-bit punks who give us all a bad rap in the eyes of the irreligious. I could do one of many things: I could yell at them and cause a major scene, bringing untold shame unto my wife and kids, one of whom was standing there with me. My son would then be traumatized for life, and I'd have myself to blame for that. It's not what I want on my conscience. I could've done something a bit more discrete, like knocking off his Shtreimel while he wasn't looking, or "mistakenly" bumping into him. That way he's not really sure if it was intentional, since I know he's always looking over his shoulder, nobody gets embarrassed, and my kid still loves me. Then again, I did mention to you that I'm from the "non-violent" Hungarian faction, the ones who just went about their business peacefully, without infighting or rabble-rousing. That would disqualify me from any proactive moves, even towards scoundrels like those guys, and even when I'd have lots of support from the people around me. "You can take the man out of Hungary, but you can't take the Hungarian out of the man." I can't really blame the Snags for buying into this, since this was "information" that was placed right in their laps by so-called and "historians", "truth-seekers" and "history buffs," but what I can blame them for is taking the bait without thinking just a little bit. By "thinking" I mean about the can of worms that they open every time they say "Lubavitch did diddly squat," Und So Veiter. Then again, nobody ever accused them of being able to think, at least not the Snags of the last 60 years, the Litvishe Yidden of Amohl could think. I'm still in the midst of reading the biography of RMBW, and I'm intently reading the chapters pertaining to the holocaust and his rescue efforts. Truthfully the Zionist-bashing, directed mostly at the leadership in Palestine and its affiliates in the free world - although it shouldn't - bothers me somewhat. I guess that's what happens when you dislike some of the ways of the Satmar you dislike much of what they do. The author -a grandson of the protagonist - seems to be heavily influenced by the Satmars, but you've already heard that from me, no need to repeat it. Most of the book, and understandably so, deals with what the protagonist and his associates did to save Jews, but a lot also deals with him being frustrated at the fact that the Jews in the free world, in America, England, Switzerland, and Palestine, did little to help. He blames the inaction of the Leftists-Zionists on the fact that they saw this as an opportunity to finally get their wish: the creation of a Jewish State in Palestine. There's also the idea that they hated frum people so much that they mamesh didn't care that they'd all be exterminated, especially if it was going to get them a state. The fact that some of the people he worked with were also Zionists - although maybe not Leftists - may seem to cast doubts on that accusation, but this has become fact within Charedi circles, especially the anti-Zionist factions. The official excuse they gave was they didn't want to send money to the enemy, which is where the money would've ended up, since RMBW's plan was to "buy" lives by giving the Germans first money and later trucks and supplies, since by late 1944 the money couldn't buy much, so they needed supplies. IIRC the Allies weren't happy with that plan either, since all they wanted was to see the defeat of the German army. Then again; the fact that Kastner was assassinated before he could testify at the trial held in Israel in the '50s sure makes things look suspicious. This is not the point of the thread here, but will serve as a springboard to our relevant topic. RMBW was quite frustrated at the lack of activity on the part of frum Jewry in the free world, and wanted answers - no, demanded answers. I had no real relatives here during WW2, so I can't ask them what they did, and the excuses are plenty. "We didn't know what was going on." "We couldn't believe that the GERMANS, the cultured people of the West, would do such a thing." I've read all the Artscroll books on the history of WW2, - although not recently - and about the Hatzoloh actions that were done by the Sternbuchs and the Griffels and the Sheinfelds etc. 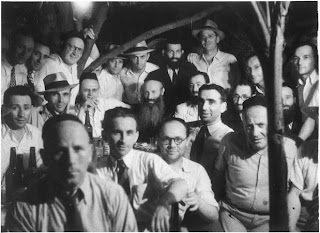 I also know about the march on Washington in 1943 by 300 Rabbis led by the venerable Rav Lazer Silver, and about the story how Reb Aron Kotler once took a train to Washington DC in order to save lives. Reb Avrohom Kalmanovitch's work for refugees is well-known, as is his work after the war in bringing in students from the Sefardic lands and integrating them into the Yeshivah and community. But in the greater scheme of things, when we speak of Hundreds upon Hundreds of Thousands that could've been saved, even after Polish and Russian Jewry (in the Nazi-occupied parts) were wiped out, those numbers don't seem like much. Then again, I wasn't there, but neither were any of you. Does it make sense for me to sit here Sixty some-odd years later and judge them for what they could've done? of course not. However, since many of you out there, and you know who you are, see fit to decide what was and wasn't done by certain people you never liked anyway, and you decide whether or not others have the right to crtiticize, let's sit and examine the facts, shall we? Legend has it that the Ponovizher Rov z"l, who himself was not known to be very active in the Hatzoloh efforts, was quite unhappy with the Chazon Ish's lack of action during that time. A Quote that goes something like "M'hut GeTrunken Orange Juice in Eretz Yisroel BeSha'as Yidden hubben gebrent" is attributed to the PR about the leadership in the Holy Land. However, he himself was busy starting the esteemed Ponovizher Yeshivah while Europe was burning, and opened its doors in 5704, when there still was much to be done. That was the case in America as well, where the previous Lubavitcher Rebbe established a network of schools, Yeshivas, and educational organizations dedicated to strengthening Yiddishkeit in America and Canada. The book Ish Chamudos seems to think that not much was done as far as raising money for the rescue of Jews. They mention that in 1943, when Stephen Wise's rescue organization disbanded the religious Jews then began to mobilize somewhat. Until then their hands were supposedly tied, whatever that means. (That was the time of the march on Washington by the Rabbis.) 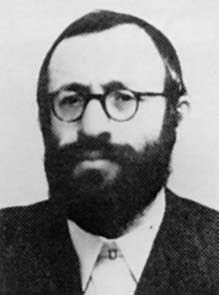 Rabbi Kalmanovitch ran around collecting money, and managed to put together 100,000 Dollars, which was forwarded to Europe. Students from Yeshivos Torah VoDaas and RIETS remember getting a few days off to go and collect money. Other than that there doesn't seem to be much as far as major rescue efforts. IMHO the Artscroll books on the War rescue effort were BiBechinas Makdim Refuoh LeMakeh, beating the criticism to the punch, showing the world that "look, we saved lives!" When in reality, after the Mirrer and Kletzker Bochurim were fed and clothed there wasn't much to speak of. After the war lots of care packages were sent, sure, but most of that was done by the irreligious "Joint" anyway. Sorry if I offended anybody, and I welcome any and all relevant criticism. Harry's blog has seen an exponential decrease in comments over the last few months, and I'm wondering why. It's not like the topics were once that stimulating, and recently haven't been. No, it's the same anti-Charedi, ModOrth spin, with some Chabad bashing on the side for good measure, just to reassure the frummies that he's "one of them." So why then have they abandoned him? Maybe he needs to up the Chabad-bashing just a bit, to reel them in, you know. Then, once they'll come back maybe he can go back to saving the world. 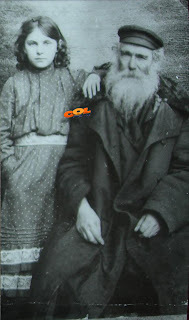 Above is a recently-discovered picture, taken in Lubavitch in 5668. So far the guesses range from Reb Srol Noach Blizinski (wrong) to Reb Mendel Futerfas' father, Mendel, to a Majdanchik, to the Rebbe's Zeide, Reb Boruch Schneur (probably not). They seem to have cropped another person in the picture, the one who's hand is draped over the Chossid's shoulder. It's not the little girl's hand, as we can plainly see that the material on the sleeve is different than the dress she's wearing. What we do know is that he was a Chassidisher Yid. Domb is a Talmid of Chachmei Lublin and a Strikover Chossid, which left him all alone after WW2 as far as having a Rebbe and general direction, although it may be the Strikover influence that's behind him after all. The Satmar Rov's jabs at the Agudah were nothing compared to Mr. Domb's, as he had nothing to lose from attacking them head on. 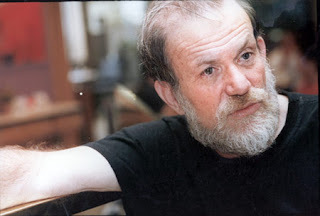 His articles in HaChomah were fodder for all Kanoyim, and were read with great zest. His heavy Germanic accent only adds to that, and makes his comments even more biting. A sharp, cynical man, yet seemingly kind and charming, so unlike the wannabe NK fools of today who he so despises. Before they came unto the scene Yerachmiel Yisroel Yitzchok Domb was persona non-grata as far as the Agudah and mainstream Charedim, as well as the Religius Zionists were concerned. It seems like the Neturei Karta is open to all, not just residents of the Karta - Yerushalayim. This makes no sense. After all, if one lives in London, where Domb lives, why then is he considered one of the guardians of the Holy City? Can I - a resident of no city - also join? Or is he an honorary member? Reb Lazer Plachinski passed on last week at the age of 96. He was a grandson of Der Alter Fun Slabodka, - His father Reb Leib was the Alter's and Alteh's son-in-law - as well as a son-in-law of the Tzaddik Reb Aryeh Levin. That in turn made him a brother-in-law of Rav Elyashiv, whose late wife was also a Levin. He also was one of those great Geonim who never "made it" as far as being known to the masses, whereas some of lesser caliber do, mostly because of the positions they held or the "noise" they made. A quiet, unassuming man, he accepted his lot, and "drowned" himself in the sea of Torah he so loved, never really to be heard of, presumably because he wasn't busy condemning this and that all day every day. Reb Michoel Ber Weissmandl zt"l is a personality that seems to have found favor amongst Jews of all circles, Chassidic, Litvish, and Hungarian. They know him mostly for his efforts to save Jews during WWII, and for his establishing the Yeshivah Farm Settlement in Mount Kisco, aka Nitra Yeshivah. However, the layman knows little about his personality and about his opinions unless he reads up about him. For the Hebrew reader that opportunity has just knocked, in the form of a book ",איש חמודות" the book that tells of the life and times of a leader who passed on in his prime, a broken and devastated man. I too was immediately pulled towards the book when I saw it in the book store, and I knew that I need to have this all-important biography, for myself, and to share with you, the readers. 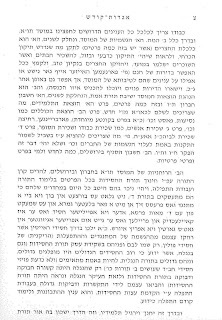 I'm happy to report that although the author, as many these days seem to do, for some reason needs the support of the Satmar Rov z"l to approve of his zeide, and takes a very "Satmarishe" position on many issues, painting RMBW as a quasi-Satmarer, he does not disappoint in other areas, and has done a fine job. There are many, many quotes attributed to RMBW that are taboo today, you'll never hear them repeated, at least from the people who really know, and were there when they were made. Quotes he's to have made about Rabbonim and Roshei Yeshivah who became the Gedolim in America and elsewhere after WWII, and mostly related to the efforts, or lack thereof, made to save Jews during the war years. He never forgave them, much as he never forgave the secular Zionists who refused to cooperate with him. He would lay away awake at night and cry bitterly over the vanished world of Jewish Europe, all the while trying to rebuild, although he believed that it'll never be the same as it was, no matter how many Shtraymel-Machers there are in BP and W'burg. One such speech was probably made to the Bochurim in the Yeshivah after Kol Nidrei 5708, when the Yeshivah was still in its original location, in Somerville, New Jersey. Reb AC Spitzer of Boro Park, the former Viener Dayan, is quoted as saying that those present will never reveal much of what was said at that 4-hour speech. The tears and screams at that speech will never be forgotten. There's much more to be said about the book, but I'd like to focus on one short story there. KeYodua; after the war the West German Government decided to make good to all those who survived the atrocities, and pay them a monthly stipend called Wiedergutmachung. All of my grandparents would get that monthly check in that very distinct envelope. 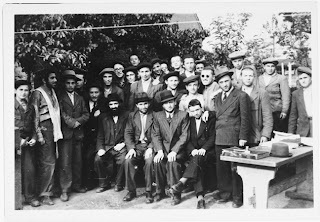 The Government of Israel also was supposed to get a large sum from the Germans, besides for the money that went to individuals, and if I recall correctly Menachem Begin and the right-wing parties in Israel were adamant about not accepting any money from the murderers who think that they can pay us off for a few dollars. Yeshivos in America were also given monies at that time, and the amount given was decided upon by a board of Roshei Yeshivah. RMBW didn't want to take the money, saying that since he needs to sign the back of the check, where it says that you forgive them for all crimes they committed, how can he sign? For a few dollars we should forgive and forget? He also said that he doesn't want that the gold they pulled from his mother's (HaYad) mouth should end up in his hands in the form of a check. Rabbi Leo Jung, who was instrumental in helping the Yeshivah move to the location in Mount Kisco, asked RMBW why he doesn't take the money, after all it'll benefit Torah? The answer was simple: Yes, Chazzer is Muttar BeSha'as Pikuach Nefesh, but is there an Isser to eat excrement? no. Would anyone dream of eating it just because it's not Treif?! That was RMBW. During Aseres Yemei Tshuvah of 5714 there was a meeting of the representatives of Yeshivos, where it was decided how to divide the monies, and how much each Yeshivah should get. The end result was that the Mirrer Yeshivah was to get twenty percent, Lakewood was to get twenty percent, and Nitra Yeshivah only five percent. RMBW was beside himself and demanded an explanation. 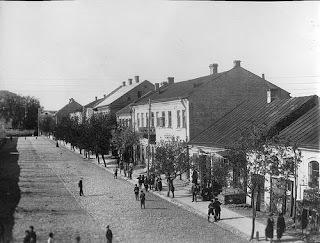 "If we go according to what the Yeshivos were before the War, then in Mir there were 100 students (that's what the book says, I'm not sure where he got that misinformation from - HT) and in Nitra there were 200 students, BeMeila kumt zich unz mer fun zei. If current number of students are used to determine which Yeshivah gets what, then Lakewood has 150 Bochurim, and so does Nitra! Why then the discrepancy in money allocated to us?! One of those present answered: Rav Weissmandl, מען גייט ניט לויט די כמות, מען גייט לויט די איכות.......... We go according to quality, not quantity...... After that he was quite and said no more, seeing it as a sign from heaven that this was his lot. That the Rebbe was enrolled in the Sorbonne in Paris. This is the only remaining record book that shows the students enrolled at that time. All other records were apparently destroyed during the student riots of 1968. He enrolled in November of 1937, after graduating from the ESTP in July of 1937. The date of birth used here is March 1, 1895, the same date used in the naturalization papers, as this was common practice at that time, to "make yourself" older, so as to avoid the draft etc. I knew Reb Moshe Zev Reicer. I know his daughters, and I know the son, Yoel, who's interviewed in the JEM video about to be released. I always heard from him that he knew the Rebbe in the Sorbonne, and that he was a "Koodesh VeTooher." Yet for some reason I never put 2 and 2 together when all this discussion about the Rebbe and Sorbonne was going on. I guess the Yetzer HoRah wanted us to believe what was being written on certain blogs, and what Menachem Friedman was saying and writing. It all seems so simple now. How could we have been so stupid as to believe a bunch of revisionists and wannabe historians 70 years later?! It's a simple "Efsher LeKayem Shney'hem!" I too need to go to the Ohel and beg Mechillah. Schneur WAS right; it was Zorach Warhaftig, a Mizrachist, who was instrumental in getting the visas for the Mirrer Bochurim! I seem to remember seeing Moshe Zupnick in Boro Park. There seems to be more of this video, I just can't seem to find it now. Guravitzer blog is online. 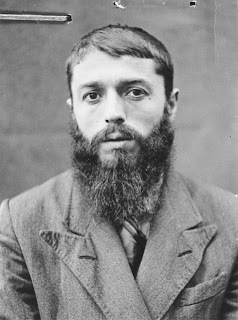 His premiere topic is the Rebbe and his studies at the Sorbonne, a topic that surely interests many of you. Newly-uncovered evidence may surprise you. Reb Don Segal not sitting Shivah for his irreligious brother, Yisrael. Yisrael Segal died on Chol HaMoed Sukkos, yet nobody seems to care. At least not his immediate family. We wrote about him not long ago. The secularists do seem to care. His brother Reb Don, the Mashgiach, was seen participating in HaKofos Shniyos on Motzoei Yom Tov in Israel, instead of sitting down to mourn the loss of his (younger) brother. It seems to be based on the Psak of HaRav Elyashiv, which seems to be correct at least as far as the first four Chelkei Shulchan Aruch are concerned. Then again, I'm a Hoyle Am Ho'oretz, and could be wrong on that end too. Maybe we don't have to go to the Finfte Shulchan Aruch for advice as to how to act. The exact wording goes something like this: מתעטפים לבנים ואוכלים ושותים ושמחים שאבדו שונאיו של מקום. I guess Reb Don thinks that his brother hated G-d. That's just sad. The defenders all say that he's correct in doing so. After all, didn't he never miss a chance to blast religious Jews, includingh his own parents? didn't he expose his parents (as if) by announcing to the world that they too read the secular papers and visited the Edison Theater in Jerusalem on Motzoei Shabbos? didn't he publicly question the existence the G-d, and worse, deny it? Didn't he publicly ask that no Shivah be sat for him, and that he buried in a secular cemetery in a secular ceremony? Why then give his soul the benefits it gets when shivah is sat and Kaddish said?! 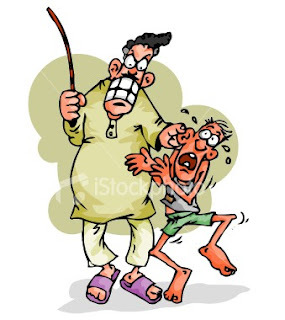 But we forget one thing: Reb Don suppoedly does know the truth, and he knows that the Neshomoh right now is begging for it's atonement and to be saved from the wrath of Gehennom, so why not show a little mercy towards a Bruder'ke and sit Shivah for him?